The well known actress and Deaf reporter Dawn Jani Birley accepted the honour to be Master of Ceremonies at the Canada Deaf Games (CDG) that will be held from February 21st to 24th, 2018 in Winnipeg. Native of Saskatchewan, Birley now lives in Helsinki, Finland where she pursues a career in theatre and television. While she is on Canadian soil, she will also animate and moderate the Coach Summit organized by the Canadian Deaf Sports Association (CDSA) on February 23rd and 24th, 2018. Birley is no stranger to the Deaf sports world as she played Basketball and Volleyball throughout elementary and high school as well as university. She took on Taekwondo at age seven, and represented Canada on the national and international levels between 1992 and 1999. She was voted MVP of the 1995 Canadian Taekwondo Championships — a first time ever for any female athlete in this sport. The International Committee of Sports for the Deaf (ICSD) awarded Birley with the Sportswoman of the Year award in 1996. During her studies at Gallaudet University in Washington, DC, Birley played varsity Volleyball, Basketball and Softball. After graduating in 1999 she moved to Scandinavia to teach and this is where she discovered professional sign language theatre. Her time living in Norway and Finland eventually led to a career change from teaching to acting. 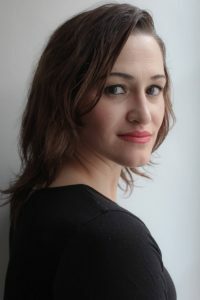 Birley became a professional actress in 2008, and in 2014 she started a Master of Arts in Physical Theatre at St Mary’s University in London, England where she was the only Deaf student. Once she graduated with Merit from her Master’s degree, Birley stayed overseas in Sweden and Finland to pursue her career in theatre while remaining involved in Deaf sports. Since 2009, she works as a reporter with H3 and covered the 2011 Winter Deaflympics fiasco in Slovakia. Birley also works with the ICSD and Deaflympics as a reporter. She was on the Commission of Deaf Women in Sports to encourage more women in participating, and represented the ICSD at one of the International Olympic Committee events. In 2015, she was nominated Artist of the Year by Riksteatern in Sweden. This year she received two important Canadian honours — the Toronto Theatre Critics Award for Best Actress in a Play and Deaf Person of the Year from the Canadian Cultural Society of the Deaf.